A few weeks ago, Ruta Leltye from Joimove in Lithuania, popped over to Glasgow to spend some time with our founder, Selen Yilmaz. 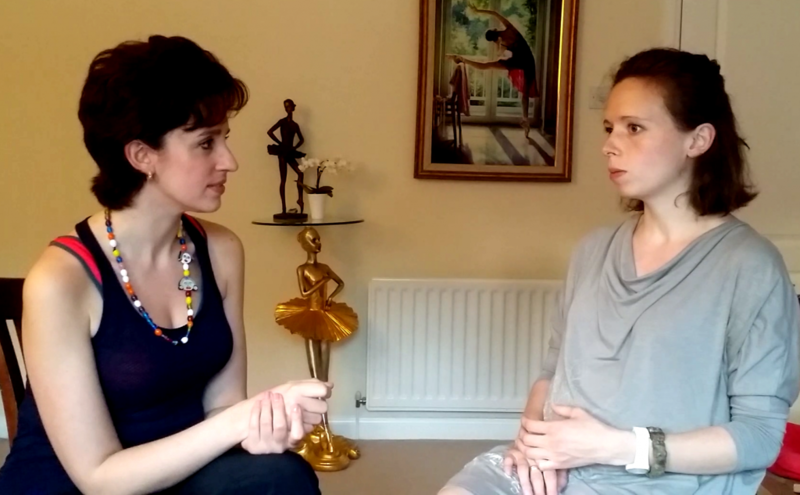 She got the chance to interview Ruta and find out all about her and what makes her tick. What’s your relationship to dancing? I think I have dancing in the blood. From as young as 5 years old I was expressing myself through dance and movement, anywhere and everywhere. Not only was I dancing, but I would put on shows with people and props. I just loved it. My parents took it as a sign and I started ballet. And was dance an important part of your life before you joined Joimove? I graduated with a degree in psychology from university but dance was always an important part of my life, even during my studies. Even aside from teaching dance, which I continued to do, I believe my educational trajectory was always guided by my love of dance. Not only did I go into psychology because I was fascinated by the human mind, the physical body and the soul, which are of course important to dance, but my Masters thesis focused on the need to understand the characteristics of successful professional dancers. Even after my Masters, with another change in direction, my focus was led, once again, by my love of psychology and dance, to the field of dance therapy. Now that you’re a mom, how do you feel about dancing with your baby? I just naturally do it! As a dancer, I guess the MAGIC of DANCE (as I like to call it) naturally overflowed in me when my baby was born, and I connected with my son in the language of my soul. And of course I still do it. So you started running babywearing dance classes because you were dancing with your own baby? Yes, I started classes, but the first thing I did was to research about babywearing, mothers, health and safety. Since moms and babies are a group with very particular needs, I wanted to make sure that whatever class I gave was beautiful, enjoyable and extraordinary, not dangerous and difficult. So, I looked for training courses since I didn’t want to re-invent the wheel. Luckily I found Joimove. It had exactly what I was looking for, and had the same outlook on dance as I had. So you found Joimove. What did you think of the training? Was it what you were looking for? To be honest I wanted to use more complex choreography routines, like the ones I was doing with my own baby. But, I know that not all mothers, fathers or carers have the same level of control over their body, or their baby, as I do as a dancer. So it was, of course, right that I learned the basics and was reminded to keep things a bit simpler and safe for everyone. What was the biggest bit of knowledge you gained from the course? The main benefit of the training for me was figuring out how to use my experience as a professional dancer for my new group of students – mothers and babies. They are certainly not like the students, children, professional dancers, schools and nurseries I’ve taught before, as they have very definite and varying needs. So, I had quite a learning curve. I had to figure everything out – from how to communicate through babywearing dance and how gentle I should be, to what I should focus on in my classes, through to what types of moves I should avoid. But overall, no matter the dancer or their needs, I was reminded that the biggest thing to focus on in any class has to be on the need to build relationships and bonding through dance. I kept Joimove’s manifesto that dance is a tool for communication, not focus to get fit! What about the difficulties of using baby carriers during dance? Yes, that too was something I was unfamiliar with. I had to learn about carrier safety in dance, and that not all movements are suitable for babywearing dance even with ergonomically correct carriers. I remember you were asking during your training about using different moves and approaches for self expression. Do you have a chance to use this practice in your classes? I certainly do! I focus my classes on creating a two-way communication channel between parent and child, with baby as a partner, not subordinate. Using specific routines and movements that help parents raise specific emotions, we create powerful connections between dancer, babies and the other participants. Yes, not just between dancer and partner, but with everyone around as well. We are all sharing this powerful tool together! It’s important to see that dance is more than just ourselves, it’s a way to elicit emotions, and a communication tool for babies who cannot yet speak. But, it’s a communication method that stay with them for the rest of their lives, not just that moment. So in my classes we create a positive atmosphere where we enjoy movements and create a practice that can be done throughout our own, and our babies’ lives. What are your plans for the next year in Joimove Lithuania? What I’d really like to do is to connect with more babywearing and Attachment Parenting communities in Lithuania so I can share the benefits of babywearing dance. 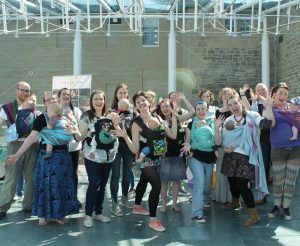 I want to spread the message about babywearing dance far and wide, to help people connect and communicate with their babies and children. I want to help create sustainable happiness in our family units by the help of Joimove International. And I’m so excited for the upcoming International Babywearing Dance Day on 21st September 2016. It’s the perfect vehicle to do this. I don’t see Joimove as a way to make a difference only now, I see it as a way to affect change for future generations. I don’t believe what I’m doing is about making our babies into dancers, I believe it’s about building self-confidence and raising our children to be positive individuals. And that’s what I’m wanting to focus on for the coming year. I’m so proud to represent Joimove in Lithuania and am very excited and happy to be part of this amazing International community and JISBD! Thank you so much! Babywearing dance may be a relatively new phenomenon, but we’re certain that it’s something that’s only going to grow in popularity. Take a look online, on TV, in magazines and in your neighbourhoods, you’ll find it becoming more and more common. From viral videos to flash-mobs to local classes, everyone’s doing it. It’s the easy, fun, active and joyful way to bond with baby. We all do it, whether wearing baby or not. We tap our toes, swing our hips and move about rhythmically when we hear music. Sometimes we do it consciously, but most often, we do it without realising it. Music moves us. The same thing happens when you’re wearing your baby. You’ll probably find you consciously or unconsciously hold your baby’s hands, gently kiss their head, wrap your arms around them for deep cuddles, sway your body, tap your toes or shuffle about when you hear music. Dancing, movement and rhythm are part of us and we pass it on to our little one. Maybe you do it to help calm a stressful moment with your baby, or you do it to play and engage with them, either way you’re connecting, caring and reinforcing attachment with your baby. You don’t need to buy any extra equipment to enjoy dancing with your baby. If you can pick up your baby or carry them in a sling or carrier, you’ve got everything you need to enjoy the physical closeness and joyful communication that is dancing. It’s important to remember, however, that no matter what way you enjoy dancing with your baby, safety has to come first. From making sure your baby’s head and neck are fully supported at all times to remembering the T.I.C.K.S of babywearing, safety first. You’re important too. Don’t over exert, watch your back, and if you’re dancing with a carrier or sling, remember to choose the right size and type suitable for your activities so you can prevent lower back pain as well as shoulder or neck injuries. Babywearing dance has benefits for both wearer and baby that span the physical body and the soul. Keeping active, no matter how you do it, gives you confidence, plenty of endorphins and can help boost self–esteem, not to mention keeping you fit. For baby, what’s better than introducing them to music, rhythm and movement through a loving dance? Family health professionals, paediatricians, physiotherapist, psychologists and babywearing experts alike all know that there are plenty of benefits for baby; from helping to sooth colic, and create better sleep, it also solidifies connections between wearer and baby, creating joyful parenting moments and a nurturing touch. It’s important however that you never see babywearing dance as means to “losing baby weight” or calorie burning. If you only treat wearing your baby as extra weight for a cardio session or practice fast and bouncy movements, you could be putting both you and your baby at risk of overheating, overstimulation, and in extreme situations, shaken baby syndrome. So, to keep safe, remember that baby is the main focus of your dance so keep it slow, gentle and smooth; not fast, bouncy and extreme. Babies learn from what they see, so if they see you being safe, active and happy, they’ll mimic your good moves. Wear your baby comfortably and safely, practice smooth and gentle moves with a low level of music, keep your heart open and receptive and you’ll find lasting joy for both of you! With the first International day recognising babywearing dance scheduled for 21 September 2016, you know it’s no fad! The number of babywearing dance practitioners is growing every day. With the help of JISBD and all of our wonderful Joimovers, we can increase the reach of this joyful practice, ensuring it reaches more hearts and souls, creating a happier, healthier world. What do you think, are there other signs babywearing dance is here to stay? What would your top four reasons be?